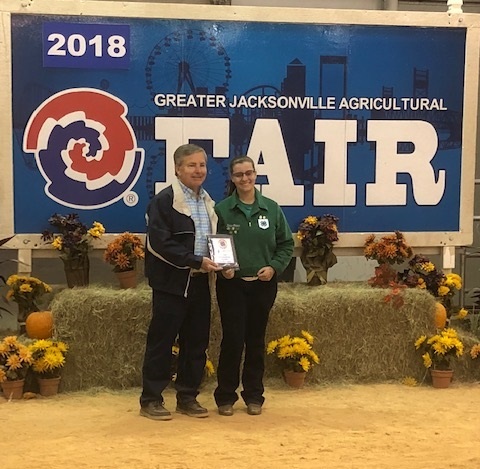 Each year the Greater Jacksonville Agricultural Fair recognizes two outstanding 4-H youth from each county in the area. These youth must have been in 4-H for at least three years, be over the age of fourteen, and have met several project requirements. This year Nassau County was proud to nominate Katie Gates and Kinley Hall as our outstanding 4-H members! Katie Gates is a wonderful 4-H member who consistently embodies the spirit of our organization. Katie has participated in numerous, varied projects over the last 10 years in 4-H, however she specializes in animal science, leadership, and emergency preparedness. Katie has served in several leadership positions within her clubs including as the president of County Council, has been at the forefront of the majority of our events, and serves as a youth member of our Nassau County 4-H Association. She recently spoke at a Chamber of Commerce meeting promoting the Northeast Florida Fair, specifically encouraging youth market project support. She has helped lead several summer camps, an animal preparedness workshop at the Southern Region Teen Leadership Conference and a massive peer educational workshop at 4-H University reaching almost 400 teens. She has also participated in County and District Events and ridden in the State Horse Show. Kinley Hall is an active member of both the Nassau County 4-H Council and the Barnyard N Beyond 4-H Club. She has held multiple leadership roles in each of these clubs including president and secretary of County Council and president of Barnyard N Beyond. 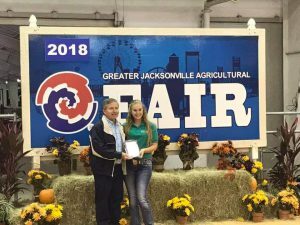 Kinley has been showing animals and competing in livestock judging at the Northeast Florida Fair for many years. She has shown steers, hogs, poultry, rabbits, goats, sheep, and dairy cattle. She has volunteered as a summer day camp counselor and participated in numerous community service projects. As a leader within the county, Kinley has served a role model for numerous youth. She has demonstrated her own confidence and willingness to push herself, which has inspired those around her. In her free time, Kinley competes in various local rodeos. She is currently involved in both a Certified Nursing Assistant (CNA) and on-the-job training program at her high school. 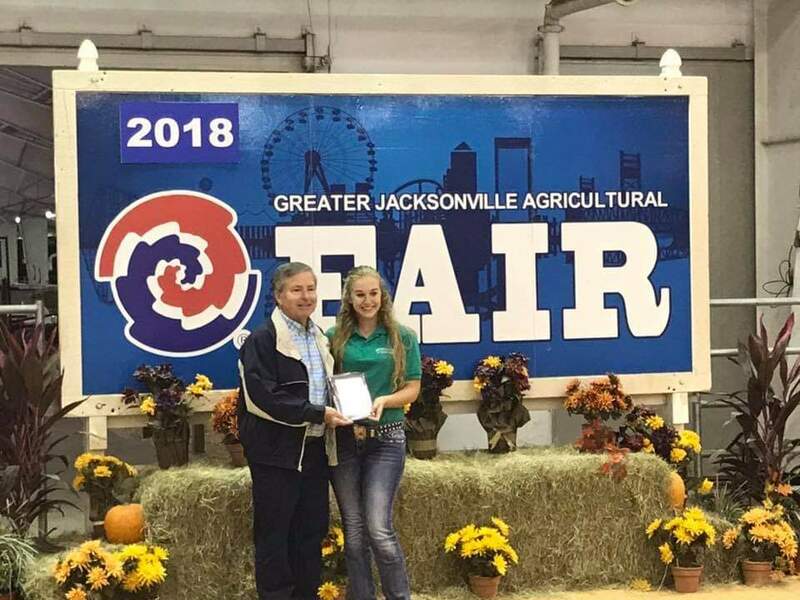 Katie and Kinley were presented with plaques for their success at the Jacksonville Fair last week. Congratulations! We are so proud of you! I am a 4-H Youth Development agent in Nassau County. My focus areas include: leadership and citizenship, healthy living, and environmental science.